For the first time in many months, I’m participating in the Currently link-up hosted by Anne of In Residence and Sarah of Foxy’s Domestic Side again. This month, the prompts are planning, seeing, making, pretending and wearing. I really love these prompts, so here goes. Planning: a siblings day with my sister. She called me on Tuesday and talked about going to a spa together someday in June when her husband is in Switzerland for work. One immediately popped up in my mind, but it’s in Nijmegen, which is a fifty-minute drive from my home. The others that are closer by only have swimwear days on Tuesdays, which would be impractical given my sister’s work schedule. Seeing: sunshine! This morning, while in the paratransit van to day activities, I saw the sun shine beautifully through the front window. The sunny weather didn’t last long though and was replaced by clouds and eventually rain. Thankfully, my day activities staff and I were still able to go for a walk while it still wasn’t raining this morning. Making: a pineapple banana smoothie. I found this recipe a few days ago on AllRecipes.com I think. It’s made with just banana, pineapple, pineapple juice and ice cubes. I initially planned to buy canned pinapple slices and make this smoothie independently. My husband however said he’d like to help me make it. As it turned out, when grocery shopping with my home support staff, we stumbled upon a fresh pineapple quite easily, so I took that one. I bought bananas that turned out to be still pretty green, so I won’t be making the smoothie till tomorrow. Pretending: that I’m fine, most of the time. I’m struggling badly with feelings of hopelessness regarding the situation at day activities, but I’m trying to keep a positive outlook. This is terribly hard and often involves pretending. Wearing: my multicolored vest. I bought it many years ago and wore it for a while, then gained so much weight that I couldn’t anymore. Since having lost 10kg in the past nine months, I’m now able to wear it comfortably again. Or somewhat comfortably, as it itches a bit. I get a lot of compliments on it and apparently it makes me look slimmer than I am. Oh yeah, another week and a half have passed without me blogging. Originally, I was planning on participating in #Write31Days this month again, but I couldn’t think of a topic. Then when I had something in mind, I couldn’t get myself to write my first posts, because I was sick and tired all week-end after my sister’s wedding on Friday. So no pressure this month once again. Because it’s already late in the evening and I badly want to publish a post before midnight though, I thought I’d do “Currently” once again. This month’s co-host is Jacqui and our usual host is Anne. I don’t drink alcohol, but I would like to give a big cheers to my sister and her husband for their wedding last Friday. They had their wedding ceremony on the beach. Though it was so windy I couldn’t hear my sister say her vows, it was a beautiful ceremony. My soaping supplies. I have tried to resist the urge to buy more supplies, because I still don’t know whether I’ll be able to soap at day activities once I leave the institution. However, since i still don’t know when I will be leaving the institution, I’ve also thought that I might as well enjoy the craft while I still can. My wheeled bag is so full it won’t close properly now and some plastic bags were tearing, so I had to re-organize my supplies. I originaly planned on keeping some out of the bag unless I’d need them, but I have no clue where else to store them. Way too vividly, if you mean dreaming while asleep. I have always had vivid dreams and they got much more vivid since starting my antipsychotic in 2010. Though the dose of this medication has been the same for several years, my vivid dreams are getting worse. Yes, I say worse, because it’s no fun. As for daydreaming, I don’t do that much lately. So much is still unclear that I have little to look forward to except for the very next moment. You see, I’m practising staying present and enjoying the moment more. So far, I’m not very good at it. Soaping supplies like I said. I also bought some new clothes for my sister’s wedding, as well as some body care products. I recently discovered some new-to-me country musicians that I like. I’m also listening to a lot of audio lectures from a company called Home Academy. I used to listen to the ones I’d bought or gotten as gifts many years ago. Recently, they were added to the library for the blind’s collection, so I can now listen to them virtually for free, sine the membership fee is way less than what I used to pay for individual magazines and lectures and suchlike. The lecture I most recently finished was on the atomic bomb. It had me vividly dreaming about mushroom clouds for days. Wow, summer flew by! Even though the weather is quite summerlike, unlike in July and most of August, it’s already September. I have several posts I would still like to write, but I am rather unmotivated for blogging here lately. It could be because my Dutch blog is three months old and it looks like this is going to be a keeper. I do like to write there, although I don’t write nearly as often as I used to write here. Anyway, because I’m not motivated for a proper blog post, I’d like to write a “Currently” post once again. Currently is hosted this time by Beth and of course Anne. I’ve been reading a lot of books and not finishing any lately. I still didn’t finish Handle with Care by Jodi Picoult, which I started in June. I also started Still Alice by Lisa Genova then, but have been leaving that for so long that I recently started over. A few days ago, I bought Do No Harm by Herny Marsh. It’s a book of stories from a neurosurgeon. There doesn’t seem to be anything about hydrocephalus or pediatric surgery in general in it. Still, it’s quite interesting. Lotion making. I didn’t do much in the way of soap making lately, but on Tuesday, I tried once again to make a body lotion. It failed again, this time for completely different reasons than the last time (I guess that means I’m learning!). The whole lotion making thing sounds a bit more complicated than I initially thought it would be. However, as I watched a video tutorial on it that was recommended to me by some Dutch lotion makers yesterday, I was reassured that it also probably isn’t as complicated as some other people make it sound. For example, I forgot the heat and hold phase, which means you need to heat your oil and water phases separately to 70 degrees Celsius and keep them at that temperature for twenty minutes. Well, that doesn’t seem to need to be dome as precisely. We’ll see next time. To be more motivated and inspired to get things done. Like finishing those books I started, making soap and blogging. I now spend most of my time on Facebook or in bed. Would really like to get more productve. Nothing really. The last decorative soap I made was already two weeks ago. I have another one planned, but need to get the motivaiton to actually go about it. I don’t have much on my to-do list at this moment, except for the things I already mentioned I’m hoping to accomplish. On Monday, I did finally cross off the routine medical exam I’d been delaying for months. I skipped the Currently linky, hosted by Anne and Jenna last month. This month, however, the words appealed to me, so I’m participating again. This word was what drew my attention to this moth’s post. One of the nurses was laid off in late June and she gave us patients a great toaster. The nurses already had one in the office, but we weren’t allowed to use it, because we had been bad at keeping ours clean, which had then broken down. Now, so far, we’re keeping the new toaster in good condition. I toasted a croque monsieur on it yesterday and it was delicious. For some walks. My new gravatar is a picture taken about three weeks ago when my husband and I walked along the water a few towns away from the tiny village we live in. Other than that, I’m not going anywhere much except for extending my week-ends on home leave. I am planning on starting ot stay home on Mondays by the 18th. Vanilla, coconut and banana everywhere. These are the three fragrance oils that came with my soap making starter kit. 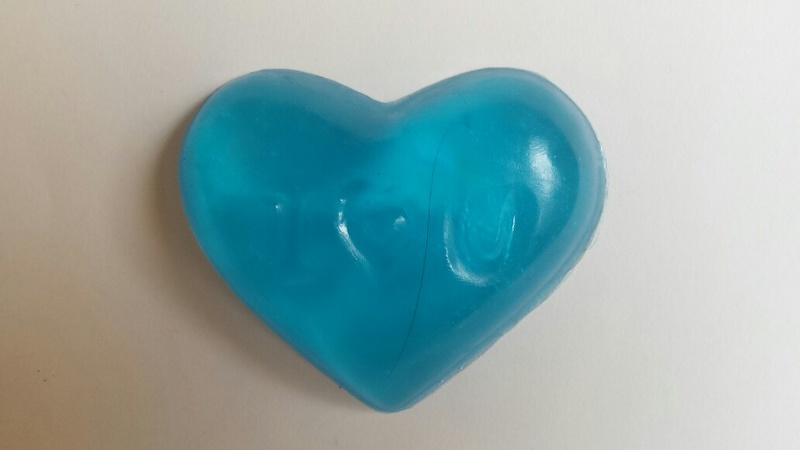 I have truly contracted the soap making virus and have made so many soap hearts already I have almost lost count. Above is a picture of one of my best ones. People are now also asking for other scents, so I ordered three new fragrance oils that are due to arrive tomorrow: strawberry, cinnamon and violets. I also ordered a new mold. T-shirts that I’ve become too big for (or let’s just say that they’ve shrunk). I hate clothes shopping, so I tried to order some new T-shirts online, but the style I wanted was sold out. Way too many soap making supplies. I ordered many of the things I had on my wishlist already, but still want more. The store I ordered my starter kit at celebrates its eleventh anniversary today, so they’re offering discounts till Sunday. Of course, discounts don’t mean you won’t spend money. I’m hoping my husband can also take me to a budget store, so I can look for storage boxes for my fragrance oils and colorants, empty lotion bottles, packaging and some other things. Soap making aside, however, I badly want a new blender, since someone took apart my last one and neither I nor the nurses can fix it so it won’t leak. I have seen people, particularly lifestyle bloggers, post a monthly Currently post before. This is a post in which you answer some prompts about what you’re currently up to. Today, I am embarking on the journey too. There are many variations on the theme. I chose to link up with the Currently linky provided by Anne of in residence and Jenna of Gold and Bloom. It’s liberation day in the Netherlands today. The celebration started after World War II ended for the Netherlands on May 5, 1945. It is also the feast of the ascension of Jesus today. Ironically, though liberation day is much more important than Jesus’ ascension to the Dutch, even to many Christians, it’s a bank holiday because of the ascension. Liberation day only is a bank holiday once every five years. Quite odd if you ask me. I say this even as a progressive Jesus follower, but I want to point out that without liberty many people would not be able to express their faiths. Official celebrations aside, we celebrated my mother’s and sister’s birthdays last Saturday. My mother’s birthday was on April 28th. My sistehr’s is the 13th of May. Yes, it’s a Friday the 13th this year and no, that’s not a bad omen. My sister was born on Friday the 13th, in fact. Lots of blogs. After the April A to Z Challenge is over, I’m surprisingly motivated to read a variety of blogs. I was hardly motivated to check out other participants during the challenge, but now I’m again interested in reading other blogs. Book-wise, a few new books are coming out this month that I’d love to read. I badly want to read The Genome Generation by Steven M. Lipkin and Jon Luoma, but it isn’t even out in hardcover yet. I saw it up for pre-order months ago on Kobo, but now the idea of an eBook publication seems to have vanished. Consumed, the new book by Abbie Rushton, is out as an eBOok and I badly want to get it. However, I’m not finished reading The Memory of Light by Francisco X. Stork yet and want to read that first. I just discovered Philosophy Experiments, a site full of philosophical games and challenges. I am in pretty good philosophical health according to the Philosophical Health Check. It found only one tension in my beliefs. I also made it through Battleground God with just one direct hit. Coffee, mostly. Oh, and a yucky type of fiber that I got prescribed to help with my chronic constipation. I can’t get used to it. I went to my parents’ on Saturday, like I said. This was jsut a day trip, as my father is doing construction on the upper floor, where we usually sleep. This month, I’m not going anywhere, except to my and my husband’s home. I’m there right now because of the bank holiday and also because I had a meeting yesterday. I met with an independent client advocate, who’s going to help me through the process of getting care funding for once I’m living with my husband.